Thank you kindly for taking the time to write a review in regards to your encounter in Dreadlocks Meme Hair Salon. When you and Mr. Imbert came for your initial consultation on Wednesday, June 28, 2017, at 3:25 p.m. You Ms. Streeter and Mr. Imbert walked in without a scheduled appointment for your consultation. My assistant proceed with your consultation and I took a small break from the client who I was providing a dreadlocks service to assist and continue with the consultation. After your consultation, you and Mr. Imbert requested to schedule an appointment with me to repair your dreadlocks. I clearly and honestly informed and showed both you and your boyfriend my calendar. It showed that I was booked for the month of June and July and my next available appointment would be in August 2017. 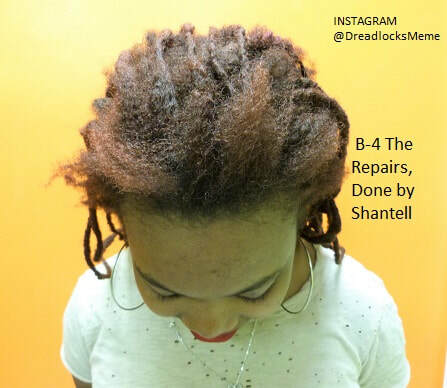 Mr. Imbert, asked “What can be done now for my lady’s dreadlocks” I suggested for her to schedule an appointment to get a routine dreadlocks service which includes wash, twist, and a protective style. I informed you that my assistant will do the routine dreadlocks service and minor repairs and the big repairs would be done by me, *Meme*. The routine dreadlocks service and minor repairs were provided by my assistant which you and your boyfriend Mr. Imbert agreed verbally and it was also documented before proceeding with the dreadlocks services. The fees you are referring to are clearly posted on our website and on ALL of our social media sites, therefore all potential clients will be well informed before any consultation or dreadlocks services are scheduled. We also have a signed copy of your consultation fee and deposit policy prior to any dreadlocks service provide to you. You and Mr. Imbert were verbally informed and it was also documented prior of the dreadlocks services begins and you both agreed to proceed with the dreadlocks services. The reason the dreadlocks service consent forms and our policy has to be informed verbally and signed by the potential client who is coming for any possible dreadlocks services prior to scheduling or providing any dreadlocks service (s), is to avoid any confusion, misunderstanding or any untrue comment or reviews by any potential clients. (The consultation fee is $27.00 and it takes from 20-minutes and sometimes up to an hour long). Evaluating the potential client’s scalp to see if it is healthy enough for any type of dreadlocks services. To obtain vital information in regards to the potential client dreadlocks service request. To discuss the time it will take to complete the requested dreadlocks services. Showing the potential client pictures or videos of some of the dreadlocks services that we have provided to be sure of the dreadlocks services the client will be receiving. To write down all the dreadlocks services that will be provided to the client. To possibly provide a sample of the dreadlocks service the potential client will be receiving. To provide an accurate price for the dreadlocks services requested by the potential client. And if the potential client agreed with all the information provided in regards to his/her dreadlocks services then a deposit will be required to confirm and schedule an appointment. The consultation fee and deposit are always deducted from the final price of the services the potential client/client has requested. The deposit is to secure the appointment for the client who is coming for dreadlocks services. In the past we used to take appointments without a deposit, but due to many clients who call at the very last minute to cancel that appointment or don’t even show up to their appointment, we have to receive a deposit to save that time for the client. The reason that we must have a consultation prior in providing any type of dreadlocks services. We want for ALL our potential client, who is thinking of receiving any dreadlocks services from us to be well informed on their dreadlocks services and the service price. We want to avoid any misunderstanding or drama with any client. And if I *Meme* feel there will be any drama I do not proceed with the dreadlocks service before the client even make a deposit to schedule any appointment. I am a very peaceful person I love my career and I love putting a smile to people’s face I honestly and seriously cannot deal with NO drama—absolutely no drama. You have about 80-dreadlocks in total that were severely damaged—Pictures of your dreadlocks was taking before and after the dreadlocks services to show the condition of your dreadlocks therefore you will be able to see the main reason it took a very long time to complete your service. You mentioned the process of your dreadlocks services took a very long time from 9:00 a.m. to 5 and up to 6:00 p.m. You rang the salon bell at 3:25 p.m. on Wednesday, June 28, 2017. While it showed your boyfriend standing right behind you as it is clearly shown on the security camera the exact time you walk in the hair salon. This is the link to the website page to show the condition of your dreadlocks before the dreadlocks services begin and how you left- so people who is reading this will have a clear understanding of what you Ms. Streeter and myself is referring to. 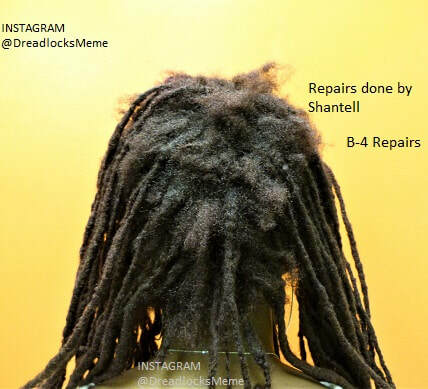 http://www.dreadlocksmeme.com/shantells-repair.html It is mandatory for us in the hair salon to document everything that we do in regards to all of our client’s dreadlocks services. We do understand there will be people who will not stop until they defame a business’s reputation. You are clearly another perfect example of why it is necessary to document everything that we do in regards to dreadlocks services to client. 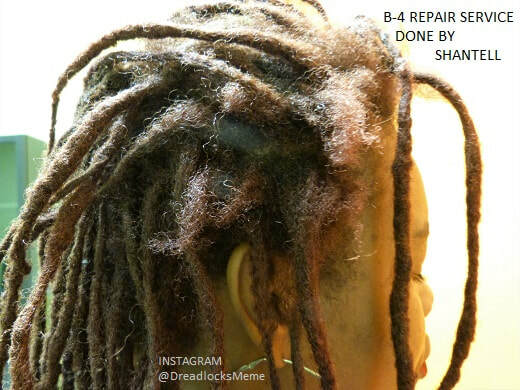 I am so happy to have repaired one of your locs and as a result you were impressed. Honestly and sincerely I was looking forward to have your dreadlocks repair and healthy again. But it was truly very difficult to please you. I was doing my client’s hair when you showed my assistant a style on a picture, she felt that she could not do it therefore I took a small break from the client who I was providing her dreadlocks services to assist you therefore you can be happy with the outcome of your dreadlocks style. You showed me a picture of a dreadlocks style and I honestly stated I will try my very best to do as it is shown in the picture but I cannot guarantee that it will come as the same in the picture because it was done by another amazing hair stylist/Loc-tician, you said it was okay. I did one style and as I was styling your hair I did show it to you numerous time to receive a confirmation from you and you said I may proceed. I did proceed with the style once you had confirm it but you waited until I was completely done with your entire head and you said you did not like it. I took it all down and I did it another way you requested once again you waited until I was done for you to have me take all the style down. At that point I inform you please be sure of the third time I was going to try again because I could not take it down again due to my client who I left on my styling chair to help my assistant with your dreadlocks style. I was aware and understood that you were unhappy and that you have to pay before the dreadlocks services ended. I clearly and respectfully explain why all of the client including yourself has to pay for the dreadlocks service before it is completed. Due to our past experience with other people who come for the dreadlocks services and waited until we finish the service to tell us they done have the full balance to pay for the service, some will say I forgot my wallet in my car, let me step out and I will be right back and never come back to pay. Many people have walked out on us after receiving the dreadlocks service and not pay us. We cannot choose who to believe that will pay for their dreadlocks service after the service has been completed, therefore to avoid that from happening all clients must pay their services in full prior to the completion of the dreadlocks services. You mentioned a lot of security cameras in the hair salon, yes indeed we do have many security devise and security cameras both outside the salon building and inside of the salon for safety purposes. We post on our wall to inform everyone in the salon that **These premises are under 24 hour video surveillance. *** It is safe around here in Hollywood Blvd. Florida but it is always good to be proactive than sorry. Also it will show the amount of time you have me and my assistant taking down your dreadlocks style and do it again. As we also have proof that your dreadlocks was dry before I even style and for us to make sure it is super dry we put you under the dryer again- there is a footage of your entire dreadlocks service done on Wednesday, June 28, 2017, at 4:00 p.m. 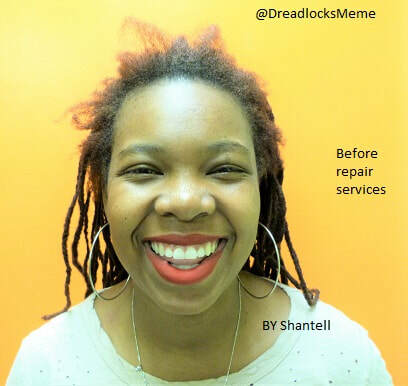 This type of dreadlocks service repairs takes many hours to complete- I have to be mentally at peace with my client who I will be providing the dreadlocks services therefore you as the client will receive only but the best type of dreadlocks services from me *Meme*. But If I feel there could be any type of drama with any client I will not be comfortable to proceed with the dreadlocks services. 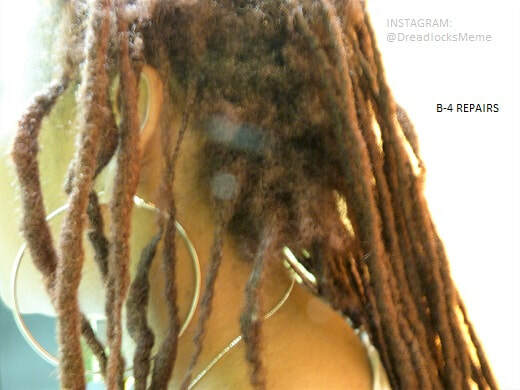 The dreadlocks service price are based on the size of the dreadlocks and the length of the dreadlocks. Listed on our dreadlocks service price book we base prices on the size, length and the condition of the dreadlocks. All of this is shown to the client during a consultation. We have this system in place to make sure that all of our potential client (s) and our existing client (s) receive the best service. This system will also avoid any misunderstanding between the clients and staff. Or avoid any over pricing for any dreadlocks services. That is the main reason we have a Dreadlocks Service Price Book. If there were anything in questions we will be able to go back and review our security system to see where the discrepancy occur. When we communicate with all of our client we have to conduct everything that was said with a follow-up e-mail, any concern matters with the condition of the client’s dreadlocks we have to document it, if we have to provide any dreadlocks service we must have a sign consent from the client therefore if anyone decide to tell an untrue story we will have concrete evidence of what occurred. Ms. Adalina Streeter and Mr. J. Imbert, I honestly wish I could repair Ms. Streeter’s dreadlocks but due to the incredible stress I was under during the time I was styling Ms. Streeter’s dreadlocks, unfortunately I do not feel comfortable to provide any future dreadlocks services for Ms. Streeter. 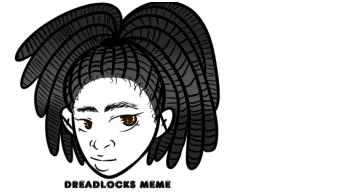 (We also have the picture consent form sign by Ms. Adalina Streeter, it was okay to post her pictures on our website and social media sites.- everything that we do in regards to the client dreadlocks services or pictures taken we always have a consent form sign). May God bless you always and I sincerely mean that. I do not have any ill feelings towards you, Ms. Streeter, and your boyfriend, Mr. Imbert. In all honesty, I wish you both many blessing and thank you for visiting Dreadlocks Meme Hair Salon on 06-28-2017 at 3.25 p.m.